The flag features a (modified) version of the CoA in the middle of a white horizontal flag. - Photo 5658: "THE KNESSET GUARD, IN FRONT OF THE MAIN ENTRANCE TO THE NEW KNESSET BUILDING IN JERUSALEM.". 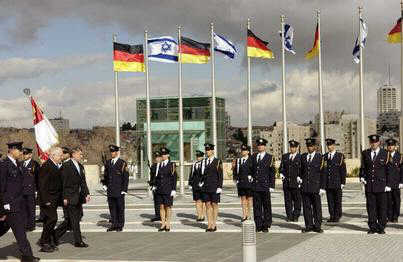 - Photo 72710: "GERMAN PRESIDENT JOHANESS RAU'S VISIT TO ISRAEL. IN THE PHOTO, PRES. RAU (R) & KNESSET SPEAKER AVRAHAM BURG REVIEWING THE KNESSET GUARD.". The Knesset Guard flag can be described as: "quarterly white and crimson, at the upper fly a golden castle, and at the lower hoist a golden menorah." The castle has one gateway, plus three windows (one at the central tower and one at each 'wing'). The central tower has four embattlements, and each 'wing' has three embattlements. 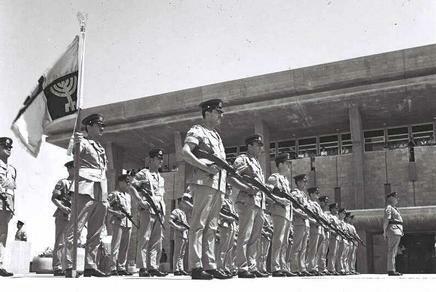 Mishmar HaKnesset is an independent force (i.e not part of the police or the army) with its own uniforms, ranks and so on, which is in charge of the security of the Knesstet. 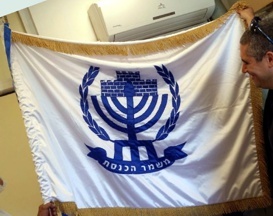 It is oparated under special act (Knesset Guard Act) with no word about flag. It sounds like a description of how the menorah was depicted in classical times (about 2000 years ago). Perhaps coincidentally, there's a famous sculpture of a menorah outside of the Knesset, and it is something of a symbol of the institution. 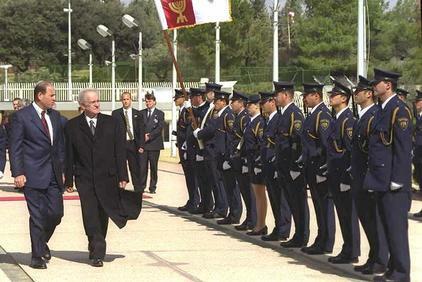 image by Jens Pattke, 9 September 2007Did the Knesset Guard colour changed? Wikipedia shows a photo of the visit of the German president, Horst Koehler on February,2 2005. Here the red field (with a castle) of the Knesset Guard colours is in the upper corner at the mast. Above is a photo of the visit of the German president, Horst Rau with the red field (with a menorah) of the Knesset Guard colours is in the lower corner at the mast. I had manufactured a manual sketch on the basis a tv-report in news "tagesschau" (German TV "ARD") on 2 February 2005.. The castle was red and idrawn n yellow outlines . The structure of the brick-work was also drawn in yellow. Only the portal was occupied with laminar yellow.